Social media marketing has, without any doubts, a huge potential to increase sales. What social media sites offer is increased brand recognition, improved brand loyalty, more opportunities to convert, higher conversion rates and better ranks in SERP. Keeping this in mind, one question pops out: what can Facebook SEO do for my business? 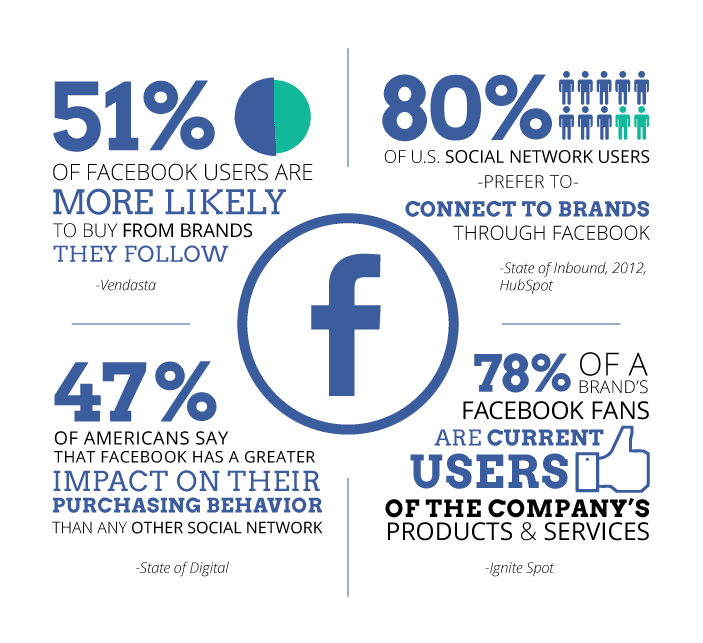 With 51% of Facebook users being more likely to buy from brands they follow and 80% of US social networks connect to brands through Facebook, like it or not, you need to start optimizing your business’s Facebook. Using social media in your SEO strategies helps you win higher page rankings? We believe that yes and this is why we’ve put together a list of tips that will help you get higher page ranks and improve your overall online marketing strategy. According to some studies, 47 % of Americans believe that Facebook has a greater impact on their purchasing behavior than other social networks and 78% of a brand’s Facebook fans are current users of the company’s products and services. 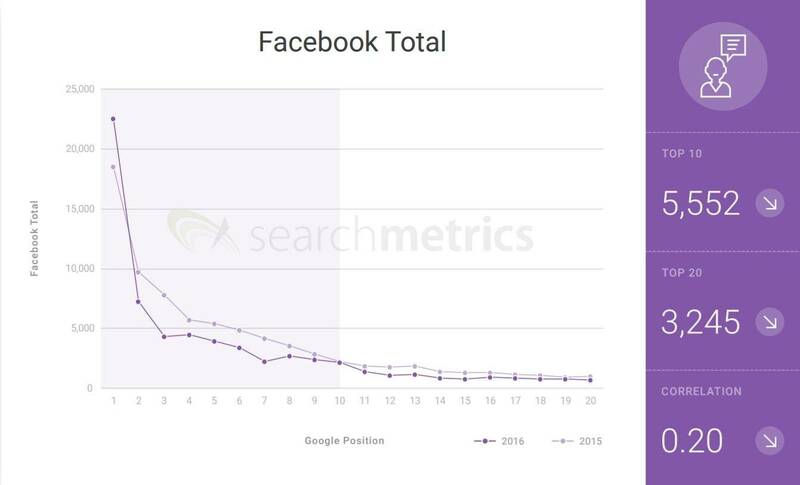 Will Facebook SEO help you with your overall ranks? To start with, links on social media are often considered higher-quality links because social sites have a high web authority. Even if your Facebook page is new, it’s likely to rank high thanks to Facebook’s overall high authority. SEO Visor claims that Google indexed as much as 1.87 billion posts. Interestingly enough, this doesn’t seem to cover the entire breadth of Facebook posts! Remember: not all profiles are set to public. According to a study made by Searchmetrics, the correlation between social signals and ranking position is extremely high, and this is also true for the number of social signals per landing page. Facebook remains the social network with the highest level of user interactions. When we compare it with other social networks, it shows relatively high signals across the first search results page. We’ve detailed this matter in a previous study on social signals influence on rankings. To continue, we will go on a journey to see how you can optimize your social profiles. Are you tired of Google Analytics? Take a break. We will offer some SEO tips that do not imply using Facebook Ads but will help you with the rankings. It will sound obvious, but your Facebook name is the first step for your online marketing strategies. Choosing a good name for your Facebook page is the first and (maybe) the most significant step. This depends, of course, on your company’s name and how much it can help you for search engine optimization as well. 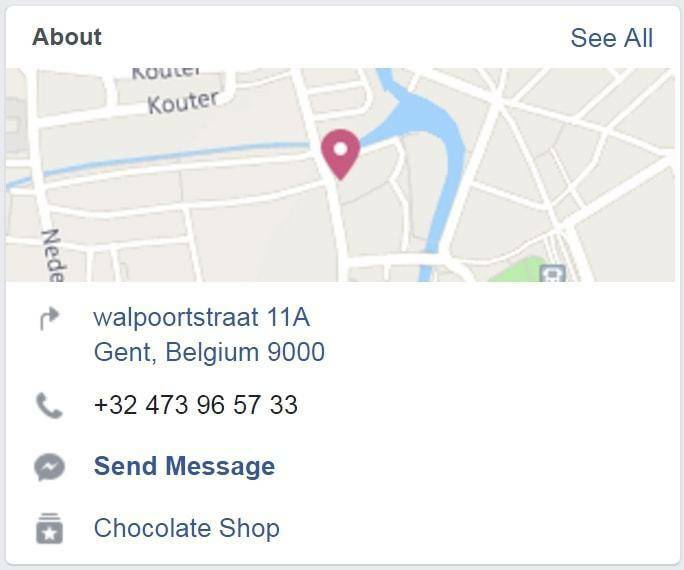 According to Rahul Dass, Business Development Executive at Creation Infoways, optimizing Facebook pages for search engines should be as simple as adding few key phrases that represent your business. We should use an example to better understand. What happens if we have a site called TripReviews.com and we use a Facebook page name such as “Trip Reviews George Smith”? It is easy to understand that we want to brand ourselves as a travel blogger and people will expect us to give free travel tips. If we use a lot of keywords we might hurt our viral growth. But what if some extra keywords might help people reach our page? Having a long title such as “George’s Trip Reviews, Booking Tips, and Exciting Destinations” will not be appealing or memorable by any means. Some visitors might even believe that we are a bit spammy because we are desperate for attention. The articles or whatever we choose to provide must be high quality and they should satisfy people’s needs. This can bring followers that will really appreciate our work and fruitful engagement. Keep in mind that the first word of your Facebook page title is the most important one for Google, as Rahul Dass claims. It is also critical to avoid generic words and to choose the best keywords to represent your brand or personality. Once you have chosen a page title, if it’s not absolutely necessary, do not change it. Think of it as a long-term choice, because you want to use your Facebook page for search engine optimization. People will reach it by looking for certain keywords and it can be pure suicide to change it when you have a lot of followers and visitors that got used to it. What you want to do is occupy a place in your consumers’ mind. Once you have gained it, all you have to do is strive to keep it. Not changing it will prove useful for your Facebook fan page SEO. As a search marketer or Facebook user you might already know that you have the freedom of choosing a vanity URL (“username”) for Facebook pages. This represents, of course, one of the greatest opportunities that this social media platform offers. After designating the username, the URL of your page will change into something like this “www.facebook.com/username”. To choose your username, access this page. Choosing a Facebook username allows businesses to incorporate generic keywords for SEO purposes. There is a blacklist of generic usernames that users are not able to register, but we are sure that there is enough freedom given to use generic usernames, or to mix up actual names with other generic keywords. We recommend you to be careful when you choose your username because it is intended to better represent your brand’s identity and personality. AdWeek believes that, in the future, Facebook might punish pages that use generic usernames by revoking status publishing rights. If you want to stay clear of such risks and be proactive, it is smart to embrace what is original or specific for your brand. For example, if you have a luxury watch brand and want something unique, a more intimate approach to show your followers how you make watches, you can choose a vanity URL like www.facebook/insidevanitywatches.com. Research shows that people can remember meaningful words easier, so do not forget to do this to turn your web address into the link your fans will keep in mind. You can only have one username for your Page or profile and you can’t claim a username someone else is already using. Periods (“.”) and capitalization don’t count as part of a username. For example, johnsmith55, John.Smith55 and john.smith.55 are all considered the same username. Keep in mind that new Pages may not immediately be able to create a username and that your Page’s username may be removed because of inactivity. We’ve written a previous blog post on some useful tips for Facebook SEO 2.0. By now, we might already know that it is of utmost importance to optimize your Facebook page by doing a keyword research if you want to use it as a marketing tool. This will help you have a good on-site SEO, as Rahul Dass claims. Facebook limits where Page owners can write large amounts of text and this is why it will be helpful to use those keywords in the “About” section to have a great company overview. Also, whenever you choose to share the link to your web page, the short description that you provide will be there along with the avatar, the page name, and the vanity URL. Now that you know this, try to think of it like this: optimizing your Facebook page starts like any other SEO process. You can look at the title of the Facebook page as the Meta Title Tag and you can consider the number of likes and the short description as being the Meta Description. Now that you know this, you should acknowledge that your description should be around 135 characters in order to show on Google SERP. Do not forget, wisely completing your “about” section is mandatory. If you make a Facebook Page for your brand, some of the tasks that you will have to do include sharing captivating content. Every time you post an image, a video or you create events on your wall do not forget to take advantage of the descriptive fields to add keywords because even if it takes only one minute to fill in everything, it can make a difference in your ranking. 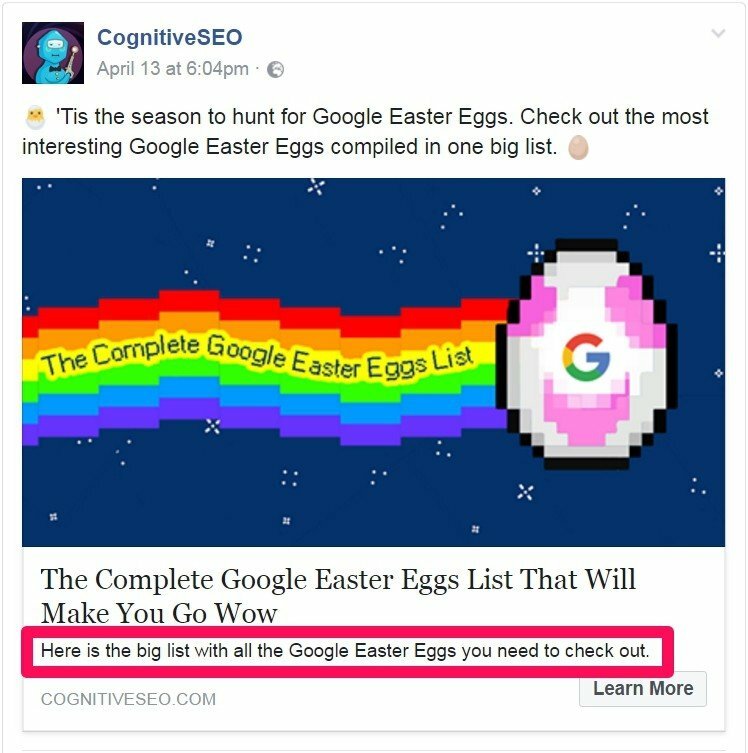 Keep in mind that this text will become the SEO title of your Facebook post. As you can see in the Google searches, the engine itself chooses what to use as meta data. 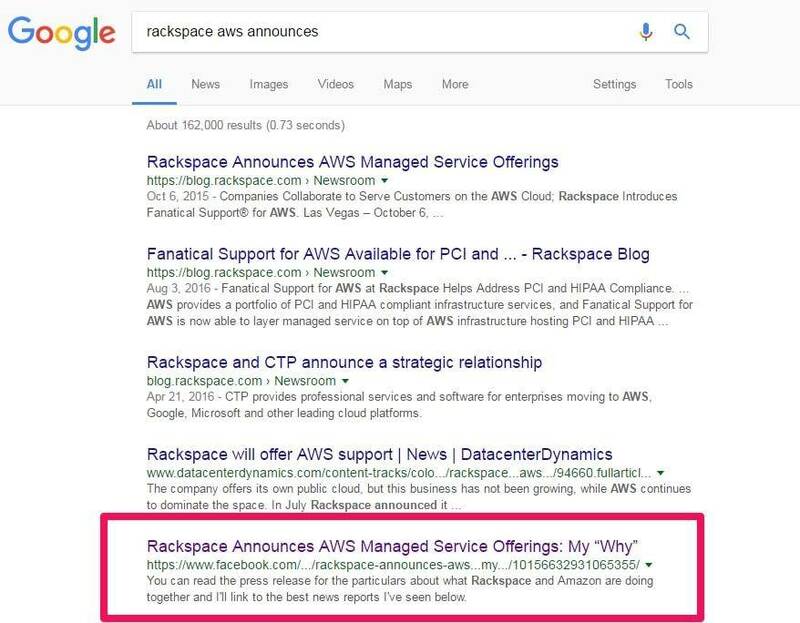 Digital marketers will easily notice that our article’s meta description was used for the Facebook page as well when it was indexed by Google. This makes us believe that basic SEO is still a powerful tool. We are all aware of the growth rate that local SEO has. This is important because using SEO on a national level is becoming more competitive each day. Local business owners might find it absurd to compete on such a scale, so they might think local for online marketing. Consumers are depending more on their smartphones and tablets to accomplish their searches. This is especially true for local searches. In order to get the online visibility, you have to make sure that you adopt the right strategy for your social channels. This is why an increasing number of businesses have adopted local strategies to enrich their SEO efforts, according to Audience Bloom. Social media presence is one of the most important factors for increasing visibility and domain authority on a local level. 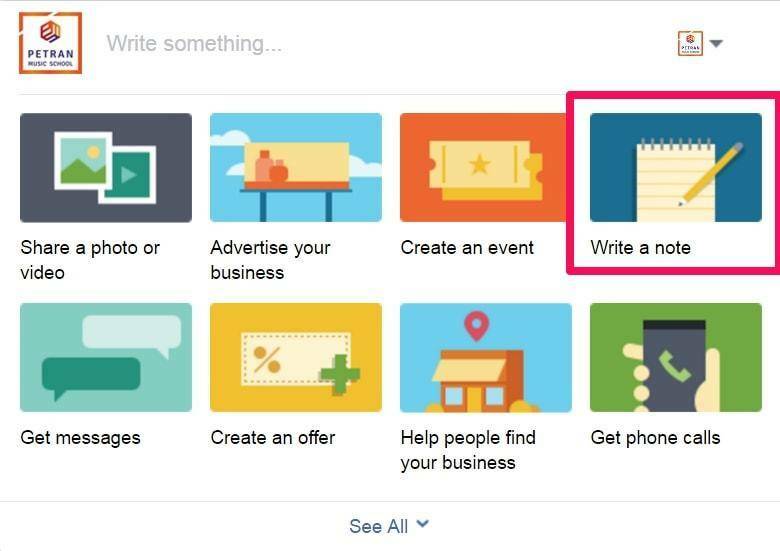 Facebook will help you as soon as you start to create your page. This is the reason why it is very important to complete everything on your “info” tab, including the phone number and address. But why does it matter? Well, according to Ad Week, the address, city, country and zip code will help index your brand for local SEO. All the details that you add will make you feel trustworthy in the eyes of Facebook and your followers as well. It will also give you the chance of including more keywords as well and, as we all know, Google really cares for all the social media pages that offer specific information. This will help by driving relevant traffic to your site. Backlinks are not useful only for your website, but for your Facebook profile as well. The more important the pages that link to your page are, the more it will trust your page. If your website is highly popular, creating links from there to your page will bring you a nice advantage. This will add to the credibility and your page will have a good opportunity to climb easier in the search ranking. What you have to do is pretty easy, according to Hootsuite. Do not miss the opportunity of linking to your business or brand page. Use your website and the articles from your blog, if you have one, to include links. If other good ranking domains do the same and mention it, you will boost your ranking in no time. This will also help to tell people that you are active in the social channels and will further help to use your Facebook page for SEO. You usually post Notes to inform or even create engagement with your fans. They are an easy way of informing fans of important news about your business or even updating customers on a current crisis. Even if you are aware of this or not, Google seems to search and index the Notes that come from Facebook fan pages. This is true only for business pages and it does not apply to personal profiles. The Notes give you the chance to add keywords rich text and this can be used to increase your fan page’s ranking for Google or Bing. It is very wise to place keywords in the title and all over the Note as well. You can also add photos, which gives you further chances to add keywords in the caption. As you can see, the Facebook Note is indexed and it appears in the fifth position. If we further inspect the Note we can see that it uses the brand name as the first keyword in the title, which is a good idea in this scenario. If you want to further boost the SEO of your website you shouldn’t ignore the power of social media. Facebook can help you get high-quality backlinks and increase the authority that your domain has. This can help you be on Google’s first page for certain keywords and you can benefit from more traffic. As we have talked about Notes before, think a bit of how much this can help your blog. If you write an article on your blog, you can create a Facebook Note and add a few quotes from your blog post that are keyword rich. Before posting it, make sure that you also suggest followers to visit your website in order to read the whole article: “for more about the Google Penguin update, check this article”. If you include a hyperlink here, you will already have a strong backlink to your domain. This will add to your website’s authority and will probably drive more traffic as well. You can see a quick example by looking at the ending of the Rackspace’s Note that we have mentioned before. The “about” tab: a lot of users are as curious as cats and will most likely visit your profile to your website. This gives you a great chance to lead users to the great content that you have on your domain. Group description: besides being a great option for conversation, the “about” section is a great place to insert a link to your website. We can look at Reputation Management as being both art and science at the same time. There are a couple of ways of bumping down highly ranked negative reviews or posts, but how can we use it for this purpose? From a Reputation Management point of view, the advantages of social media sites are that if you have a high ranking profile page you will appear higher in a search engine’s results page than other incorrect or negative information. There might be moments when you see information that you might want to be removed, but you are unable to do so. Some may refer to a negative business review posted on a blog, public law enforcement data or even a criminal database of minor offenses that does refer to you, but is no longer relevant or needs to be pushed down as far as possible in order to secure employment. Facebook users have the ability to “Like” pages and send personal messages as well. In the About section of your business page, you can also find information about the brand, its corporate headquarters, retail locations, and so on. It is very important to include as much information as possible in your social media profile because you will use it to outrank other pages that refer to you or your company. If you do a Google search of “Starbucks” you will notice that its Facebook, Twitter and other social media site pages are ranked highly. This is the advantage of using social media for Reputation Management, according to Reputable and paying attention to it will help you in the long term. If it is impossible to remove an undesirable post, what you can do is to use social media profile pages to outrank those pages that write negative reviews about you or are trying to flame you. 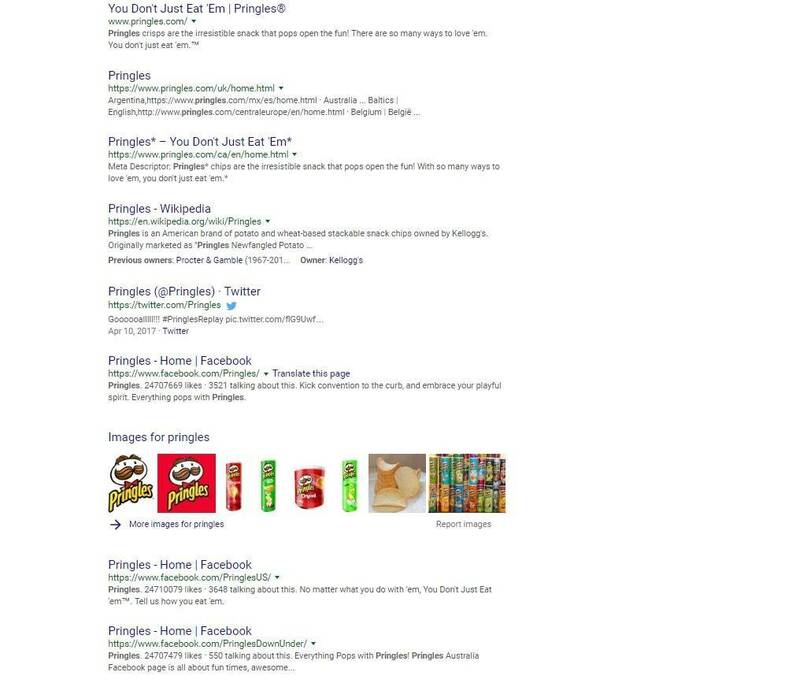 A simple search for Pringles will make you realize how much their website and social media helps them out. The first results page is filled with results that come from their website, Wikipedia, Twitter and as much as three Facebook results. Whoever searches for this brand has to go through a couple of pages to find some negative reviews about it and this is a great advantage for the SEO world. It is very important to have a good amount of followers, fans, friends and likes and to use the proper keywords to be able to outrank other pages in the search engine. Keep in mind that you will also receive reviews on your Facebook page as well, but here you will be able to respond to it. Think of the negative articles or reviews that high profile companies can receive. What really matters is to know how to successfully outrank them. 1. Do not be afraid to show your personality and use the weight of your brand name. Everything you post should portray your brand’s personality. 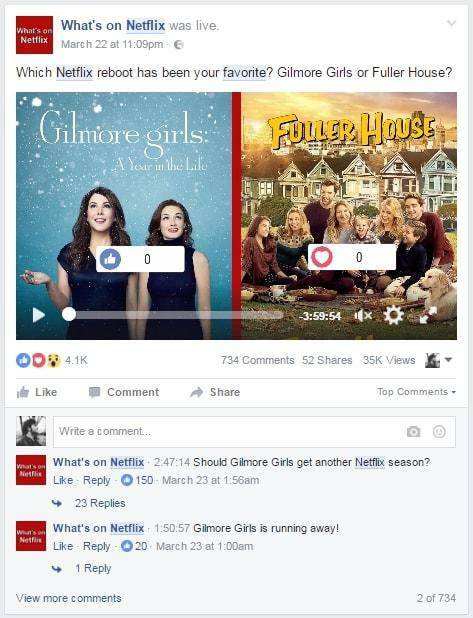 Make your fans return to the page because they like your company’s voice and tone and you might have a viral growth rate. Express yourself through your posts, through your cover photos and make the other Facebook marketers jealous. 2. Ask questions and get to know your fans’ preferences. This is one easy but efficient way of driving engagement. It will get your fans talking in no time. 3. Take advantage of images. “A picture is worth a thousand words” is an English idiom, but what you have to know is that images are able to tell stories quickly and they have great exposure in the news feed. Take advantage of your brand’s visual identity because specific visual elements will let everybody know in an instant that the picture is coming from you. Customize your cover photos, your profile picture, and everything you can. 4. 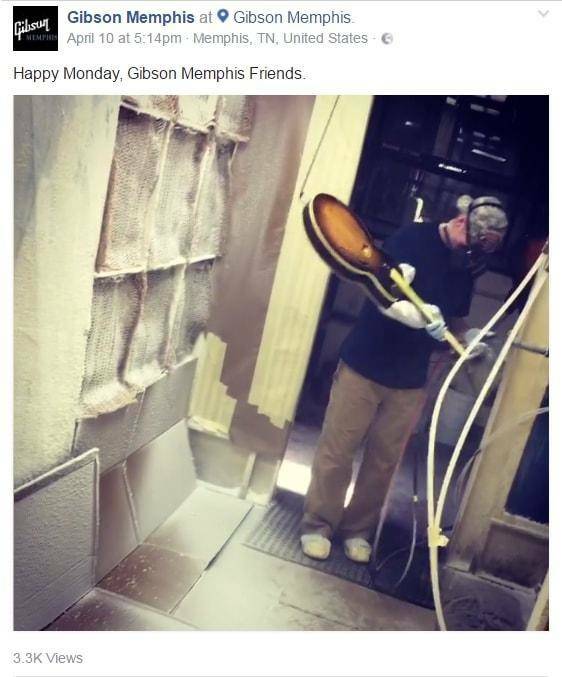 Let fans take an inside look at your company. Other than maintaining a certain transparency, this is a great marketing tool that lets you promote your brand. 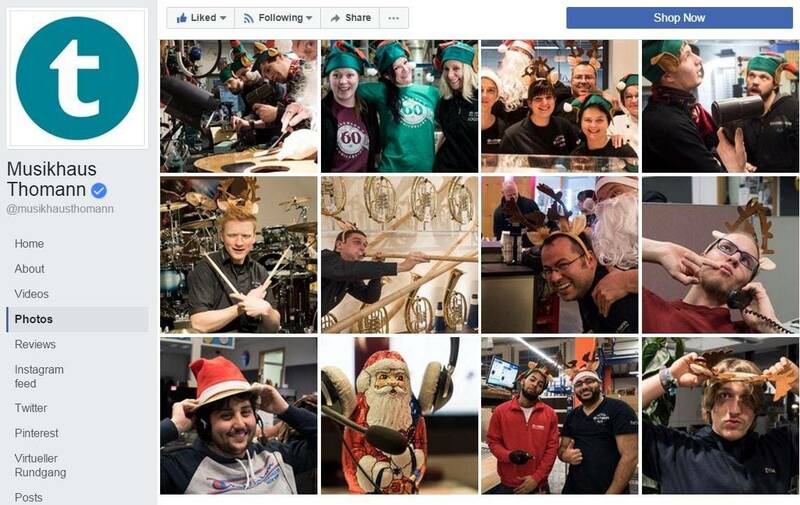 Post photos of happy employees, satisfied customers and so on. Transparency can be a powerful tool, so give your fans a quick company overview. 5. Use content provided by your fans. This will help by building relationships and by providing unique news to the followers. 6. Use call to actions and tell people to like, share and so on. What is great about them is that they instill psychological nudges that help marketers drive their audience to respond the way that they want to. It seems like audiences tend to respond better when they are given specifics as to what to respond to. Every time you post something ask yourself this: What do you want people to do? Do you want them to comment? Click the like button? Share something with their friends? A post like this in the news feed will catch their attention and will help your Facebook profile. 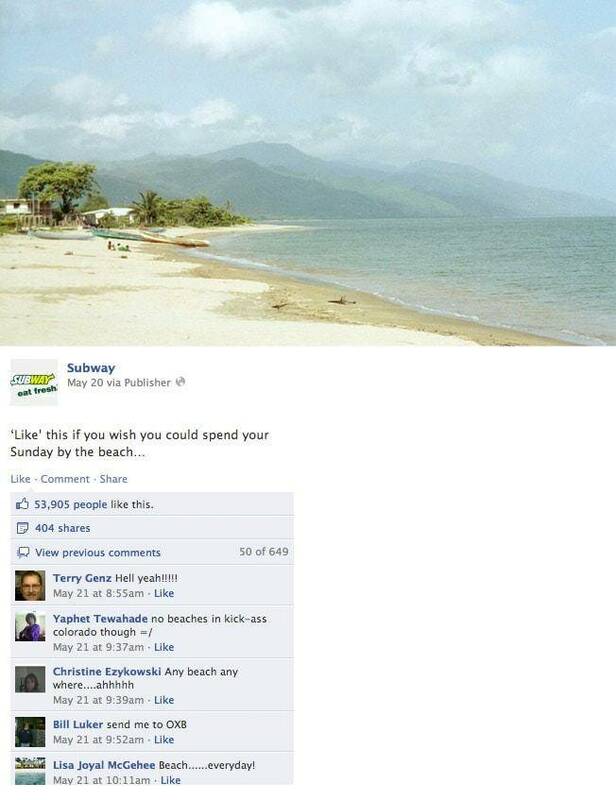 The Fast Food Franchise Subway got over 53,000 likes and 404 shares by posting a picture with the call to action text “Like this if you wish you could spend your Sunday by the beach”. Getting your followers to comment and like content in your stream will help by strengthening intra-Facebook reciprocal linking. Consider that the users also have the option of sharing your posts and tagging friends as well. Another way of creating hype is using the Facebook Live videos feature. Beware, you shouldn’t use this feature if you do not understand it yet. The Live feature has great potential, but you have to think of how you can use it within your niche first. You have to learn how to advertise your upcoming posts in order to have the best impact. Broadcasts must be promoted up to several weeks before they go live because in this case, you want to generate both awareness and excitement, as Best SEO Companies claims. Upload images or even short video teasers in order to let your followers know what to expect. You can talk about this event on your blog or other platforms in order to inform people about what is coming. Make sure you add a link to your Facebook page to let interested people know where this is going to take place. Once everything is done, make your presentation unique and do not forget to engage by responding to comments. When the live presentation is done, Facebook will archive it for future views and you will be able to check it in order to respond to comments that are posted after the event. You can use this as an opportunity to drive traffic to your website by posting relevant links in the Facebook Live Comments. This can be a great way of improving your organic link-building efforts. You’ve certainly got an idea of how Facebook impacts SEO so far. You found out how to optimize your social profiles, and how to surprise your fans with engaging news stories to get direct traffic. Even though Google’s Matt Cutts said that Facebook and Twitter signals do not influence the search algorithm, the Facebook and Twitter pages do appear in the search results and this will continue to have a great influence. More about the social media ranking factor or social shares can be found here. Matt Cutts also claimed that he does see Google crawling, indexing and understanding more about identities on the web in the long run. The information looks good. Keep sharing good stuff! We will sure do, Hamza! This is an incredibly in-depth blog post – definitely worth taking the time to read! Thank you for sharing! Simple and straight forward tips Cornelia! It’s always the basics things like including your niche in your url and username that can help boost rankings and visibility. 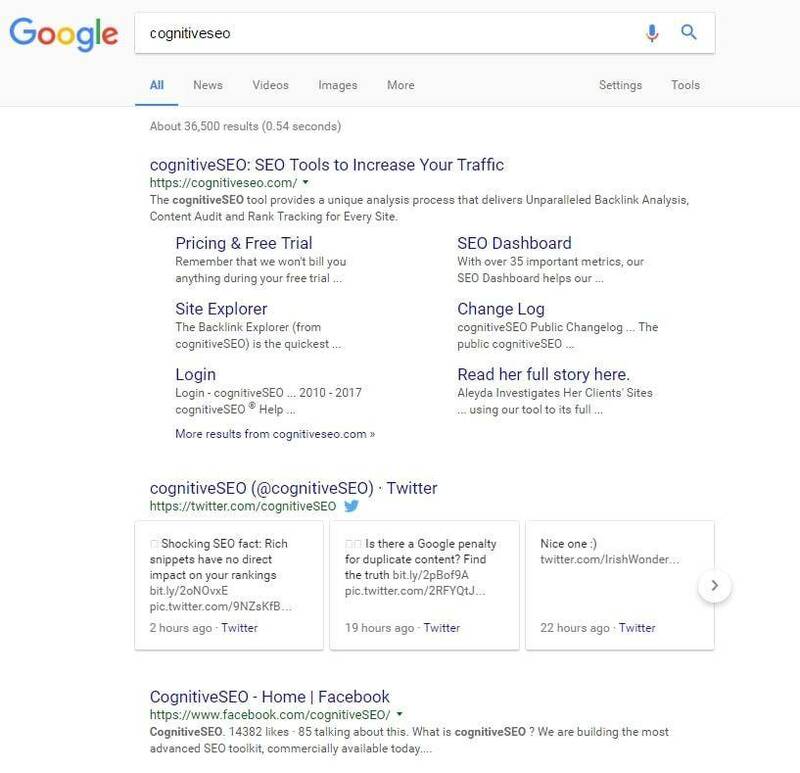 Hey i want to rank my own page on google although you have describe everything one could do to rank facebook page However, you have not mentioned where should we add more keyword or brand mentions on page for better seo boost. Kindly tell me what are some prominent field where you think i should use for better seo gain. Totally agree with “Engagement to outrank negative reviews” The negative reviews can be tackled this way. I am not sure if having a brand oriented user is more important. Changes seem to affect countries with a great time delay from the core, which is the US. I’m always impressed by the time and effort some bloggers out there put into these articles. I really enjoyed from reading the article above, You have explained everything in detail about SEO tips. Surely I will use this tips to build a SEO strategy for my business growth.